Help rural communities identify and maximize local assets, and connect to regional opportunities and self-identified clusters that demonstrate high-growth potential. Land of Sky Regional Council, AdvantageWest, North Carolina State University, Department of Horticultural Science, and the Community Foundation of WNC will build on an existing partnership to create a GroWNC Implementation Project, centered on a high- potential industry cluster in the region – the Agricultural Sector. 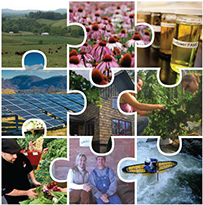 GroWNC Workgroups have identified this sector as a priority for regional economic development. The Agricultural Sector has potential for growth in numerous product chains, including the local beverage industry, natural products, biofuels, local foods, green building, and ecotourism. The project will incorporate a ‘cradle-to-cradle’ approach to create a stronger regional agricultural cluster and fill gaps in the production chain with local. In this way, the project team will focus on developing the market-based demand for products, while building the workforce and production throughout the supply chain.